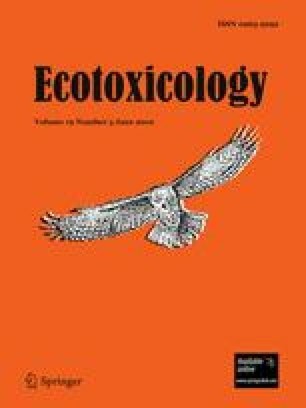 To determine effects of the antiparasitic veterinary drug abamectin on the isopod Porcellio scaber, animals were exposed for 21 days to Lufa 2.2 soil spiked at concentrations of 3–300 mg/kg dry soil. After exposure, abamectin residues in the isopods were analysed using a novel analytical method. Toxicity was evaluated on different levels of biological organisation: biochemical, cellular and the individual organism. Measurements included glutathione S-transferase (GST) activity and stability of cell membranes in the digestive gland, animal mass gain or loss, food consumption, behaviour and mortality. LC50 for the effect of abamectin on survival of P. scaber was 71 mg/kg dry soil. The most obvious sublethal effects were reduced food consumption and decreased body mass (NOEC 3 mg/kg dry soil). Additionally, loss of digging activity and reduced GST activity (NOEC 30 mg/kg dry soil) and cell membrane destabilization (NOEC 10 mg/kg dry soil) were recorded. Abamectin only slightly accumulated in the isopods, with bioaccumulation factors always being <0.1. Based on these results and current information on environmental levels of abamectin, it is not likely that isopods will be affected by abamectin, but further studies with exposure through faeces are recommended.